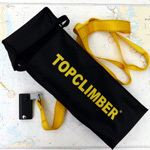 The TOPCLIMBER® consists of 2 parts, a bosun’s chair with back rest and one way jammer, and leg straps with 2 loops for the feet and one way jammer. A bosun’s chair with back rest and a one way jammer. 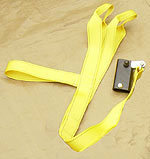 Leg straps, with 2 loops for the feet and a one way jammer. The TOPCLIMBER® rides a 7/16’’ to ½ ‘’ (10 mm) low stretch line. The metal parts are special aluminum and rust proof steel, proof against that salty environment. 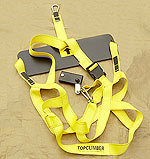 The TOPCLIMBER® comes together with a tool bag, that can be used as the storage bag. 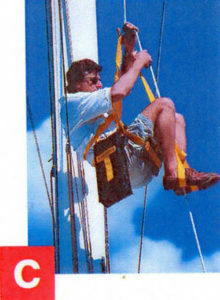 Attach the static line securely to a halyard and hoist to mast head. Secure. Feed the free end of the static line down through the top Rope Cluth. 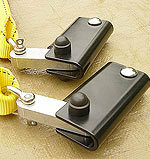 Continue feeding the same free end through the foot strap rope clutch. Now feed the line through the spacer strap. 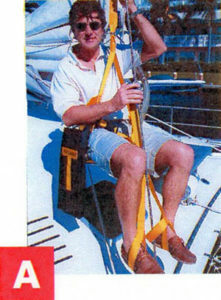 Winch slack out of static line and secure firmly on deck where desired. Finally, attach toolbag carabiner on the webbing just above the seat (left or right). NOTE: use only good quality, pre-stretch 10 mm (7/16) braided rope as the static line. 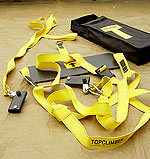 ALWAYS: inspect Topclimber® and static line before use. 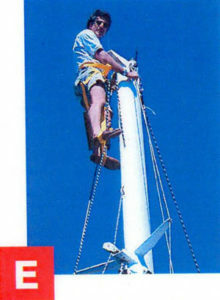 NEVER: climb the mast barefoot. Keep your feet together either side of the static line and stand up while sliding top rope clutch as high as possible. Sit down, raise your knees and press the foot trap rope clutch lever and slide as high as possible. Sit down, raise your knees and press the foot trap rope clutch lever forward and slide as high as possible. When at the masthead, keep your feet together either side of the static line and stand up while sliding top rope clutch as high as possible. 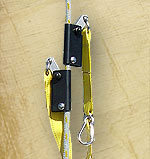 Clip reduction clip onto rope clutch shackle. 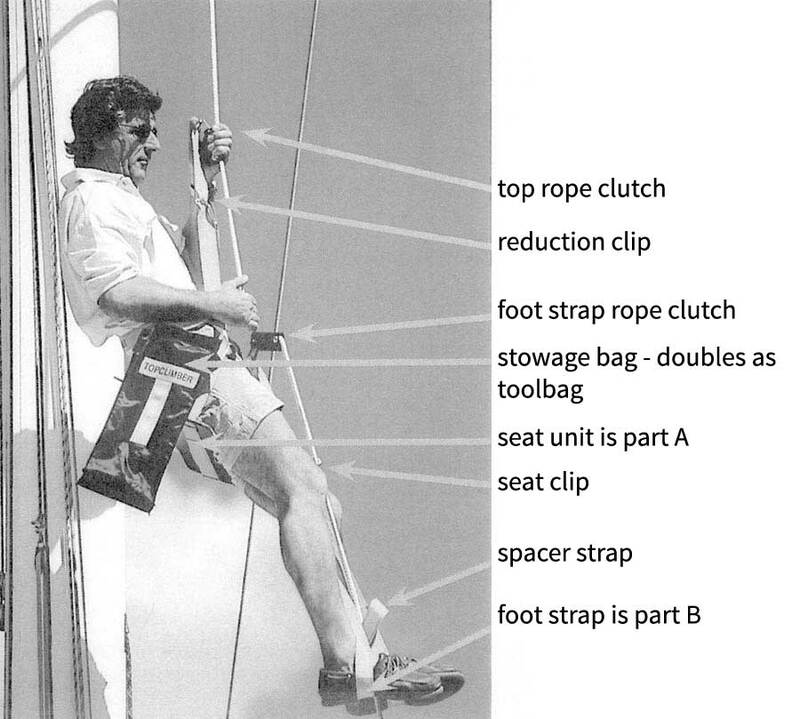 1. while sitting, slide foot strap rope clutch down to knee level. 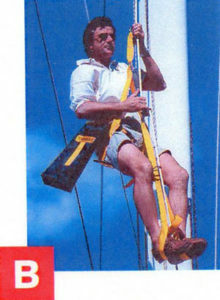 4. de-rig Topclimber®, inspect carefully, clean as necessary and stow away. 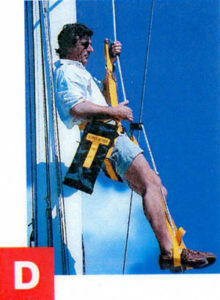 Topclimber demonstrated by Martin Holmes of Catamaran Sailing Charters Ltd, Nelson, New Zealand.